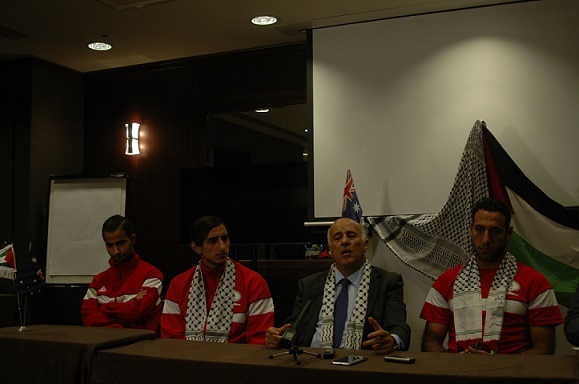 In front of a backdrop of the Palestinian flag and a keffiyeh, the Palestinian football team spoke of the challenges they have faced in qualifying, and their upcoming match against Jordan on Friday 16th January. Jibril Rajoub, President of the Palestinian Football Federation, started by thanking the professionalism of the tournament organisers before explaining the difficulties that the team face due to the ongoing occupation. He explained how even for this international tournament, two players and one official were prevented from leaving by the Israeli authorities. He took time to thank the fans who travelled from other countries to show their support to the team. He admitted that the 4-0 defeat against Japan was disappointing, but affirmed that the players were prepared to take on Jordan in their next game. 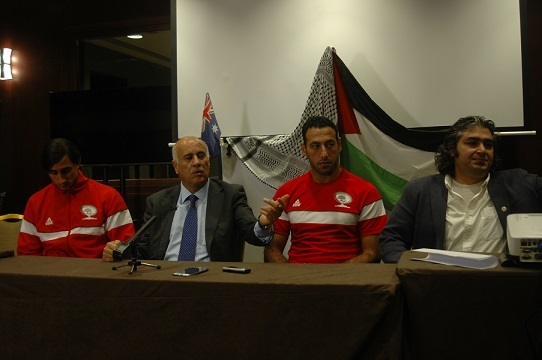 Rajoub was joined by three members of the team; captain, Ramzi Saleh, Mahmoud Eid who plays in Sweden and Aboulhamid Abuhabib from Gaza. Ramzi Saleh, a veteran of many qualifying campaigns spoke with emotion as he thanked the supporters and talked of the pride felt by Palestinians around the world as the Palestinian national anthem was played, affirming Palestine’s right to nationhood. Next to speak was Mahmoud Eid, who, as a member of the diaspora, born in Sweden, chose to represent Palestine. He said he wanted to give something back to his family and the people of Palestine. He too spoke of the pride he felt when the Palestinian flag was raised. He later spoke of how the tournament helped show the world that Palestine is a country, with real people and is more than just the bombs and war shown on television. Next to speak was Aboulhamid Abuhabib from Gaza, who scored twice in the AFC challenge cup on the way to qualification. Abdoulhamid spoke of how strange it was that the Palestinian flag was raised in Australia, when Australia does not recognize that Palestine is a country, in contrast to the vast majority of nations which do. 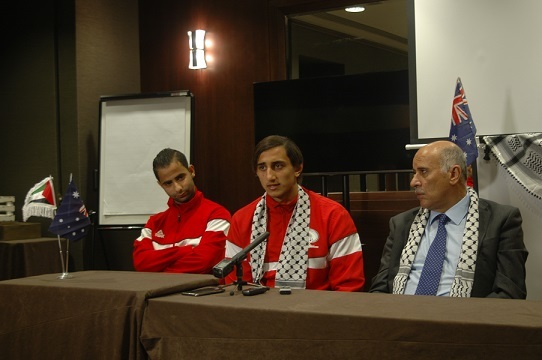 He talked about how the Israeli occupation meant that many players could not see their families for two or three years. Like all Palestinians, he asked for the right to be able to move in freedom, a right which citizens of every other country take for granted. When asked by a reporter how it felt not to be able to see his family, he spoke of not only how proud they were of him, but of how he was doubly proud of them for their support and sacrifice. Ramzi answered the same question. He explained how every single player has suffered. In 2004 he was informed of his father’s death while preparing for the 2006 world cup. Israel did not allow him to return to attend his father’s funeral. When he told his story, he explained that these actions merely made them stronger in the face of the Israeli occupation. 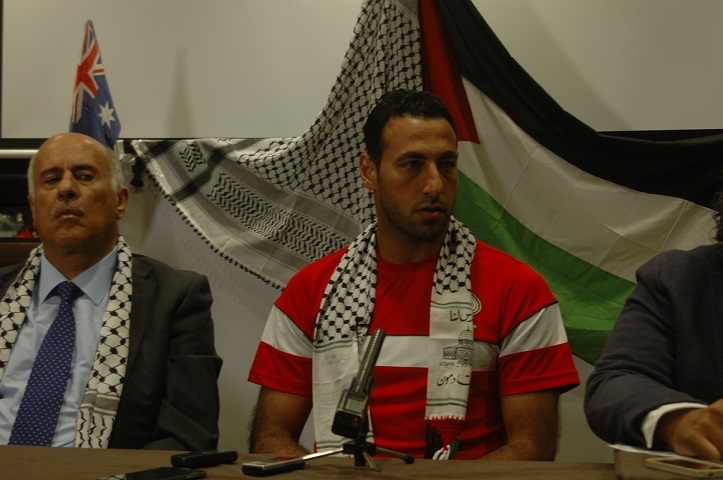 When asked by IMEMC what reasons Israel gives for denying Palestinian players the right to travel, Mr. Rajoub explained that it is Israeli policy to restrict the movement of Palestinian footballers. He also talked of how Israel will often deny access to FIFA officials. He continued by explaining how The Palestine Football Federation is trying to ask FIFA TO put pressure on Israel to end the racist, irrational policy which contravenes FIFA rules. He compared Israeli actions to those of a bully and said they were looking into having Israel suspended from FIFA if their racist policies continue. When asked by a reporter where the team was usually based, there were some smiles. To get the whole team together is impossible. Checkpoints, travel restrictions, a 20-meter high wall and all the other instruments of an occupation mean that for players from all over Palestine to come together in one place is logistically impossible, despite them all living within an hour’s drive of each other. As the President said, “sport is a good tool to show the suffering of our people”.